Ruinart Champagne held a vertical tasting of its prestige cuvée Dom Ruinart Blanc de Blancs at restaurant Apicius in Paris last week to celebrate its 50th anniversary. Starting with the 1959, there have been 21 different vintages of this cuvée released although it proved impossible to source bottles of them all. They only have stocks of 10 vintages going back to 1981 plus the 1969 left in Ruinart’s own historic cellars in Reims — the plan was to taste these 11 plus the seven venerable vintages which Ruinart’s current Chef de Cave Frédéric Panaiotis managed to purchase from specialist retailers and collectors. Sadly they couldn’t find any 1959, 1966 or 1976, three top class vintages in Champagne, the ’59 and ’76 being two of the warmest summers on record. Panaiotis did however source some 1961, 1964, 1971, 1973, 1975, 1978 and 1979. Unfortunately quite a few of these hadn’t been well cellared and the ‘69 from Ruinart’s own cellar demonstrated the importance of storage conditions and was the star among the older wines. The 80s produced the highlights of the tasting. The key thing to know about Dom Ruinart’s Blanc de Blancs style is that the fruit isn’t all sourced from the grands crus of the Côte des Blancs. It is all grands crus but there is an important element in the blend – 50% of the cuvée in the case of the 1990 though this is the highest proportion — from three Montagne de Reims grands crus Sillery, Verzenay and Puisieulx. This tends to give the wines more weight and a certain white Burgundian quality as they age. 1998: the current release (to be followed by 2002) almost colourless in the glass, it’s lemon-scented with floral notes and a hint of honey. Still very fresh, lively and youthful there is a biscuity note building but it needs more time. 1993: more colour and the first in the line-up showing real signs of development and maturity with bready, yeasty notes and an attractive richness. It’s still a surprise as to why Ruinart made this in preference to the superior ‘95 vintage. 1990: for many of the tasters this was the star of the show though I thought it lacked richness in the mid-palate, a surprise given it was picked at 10.8deg. The magnum we had with lunch was superior, still very fresh with a long future ahead of it but showing more ripe buttery notes and a lovely overall balance. 1988: A glorious, light golden colour and the highest proportion of Montagne de Reims Chardonnay (44%) outside the 1990 this has developed into a lovely, lusciously rich, silky textured wine with a developed toastiness, pronounced mocha notes and a long complex finish. Mature white Burgundy with bubbles. 1986: One of the biggest surprises in the line-up, this has gone a rich golden colour and there is a honeyed sweetness on the palate redolent more of a Semillon based pudding wine. Panaiotis says he doesn’t know what to do with the 300 bottles he left in the cellar but liked the suggestion of matching it with foie gras. 1985: Richly coloured like the ’86 this has three-quarters Côte des Blancs fruit in the blend and it’s a class act. Ripe notes of quince, a hint of blackcurrant and while it’s ripe, even opulent there’s a refreshing streak of acidity keeping the whole wine in balance and harmony. 1982: this seems to have more in common with the ’88, its paler in colour, very toasty on the nose and there are secondary notes of coffee, chocolate and ceps. At or near its peak, it would be lovely with roast turbot. 1981: a tiny yield of just 4,360kgs/ha (compare that with over 14,000kgs/ha in 2008 & 2009) this harvest produced some great wines (like ’81 Krug) and this is surprising fresh initially, leading to a concentrated buttery rich mid-palate and a savoury finish. A delight and unlike any of the other wines tasted. 1961: Not a great example of this fine year but while slightly oxidised it didn’t completely hide an underlying lively fruity freshness. Would love to try a well cellared example, Moët 1961 is one of the finest champagnes I have ever tasted. Spicy food with Champagne, it’s not an obvious choice. I once persuaded a CIVC henchman I was lunching with to try Champagne and oysters spiced up with a dash of Tabasco sauce and he quite clearly thought I was mad. But finding suitable styles of Champagne and other sparklers to match spicy food was exactly the challenge given to a number of on trade suppliers. It wasn’t just any old spicy food either, but a menu with a real kick put together by Vivek Singh at the Cinnamon Club. To help us decide what might work first of all we tasted all the wines that had been entered for the challenge, looking at the different styles and levels of sweetness, ranging in the case of the Champagnes from a bone dry Extra Brut (just 3gms sugar per litre compared to the Brut norm of around 11 or 12gms) to a Pol Roger Rich (a demi sec), which someone had thoughtfully put in. It appeared that those who merely entered the standard NV Brut style of the house they represented hadn’t fully thought things through, or perhaps they didn’t understand that we really did mean full on spicy. But while it would have been better to have had some more obvious food friendly styles whether vintages, sec and demi-secs or perhaps cuvées that had seen some oak, among the two-dozen of so samples on the table, we certainly had enough options to get an idea of what did or didn’t work. We kicked off with three fishy appetisers, stir fried crab; garlic crusted king prawn and tandoori swordfish, matching them against several NV Brut styles initially as we kept back more concentrated, pink and sweeter options for some more challenging dishes later in the menu. Each of these three dishes had accompanying sauces of varying density and strength, but the crab, which was spiced with garam seeds and the garlicky prawn dishes were easier to tame than the smoky tandoori swordfish. Chef Singh said there were two ways of approaching the matching exercise: either putting together complementary flavours or else something that was a big enough contrast to cut through the spicy richness of the food. Of the non-vintage Champagne blends those with greatest intensity and the one all Chardonnay cuvée, fared best against the fish and seafood. The extra depth, maturity and a certain gingerbread-like spice of the Deutz Brut Classic and the lifted citrus notes of the Henriot Brut Souverain getting the best response from the panel of tasters while bright and fresh Piper Heidsieck, one of the best appetisers styles of Champagne on the market, was deemed an acceptable match. For the next course of three different meat starters: tandoori chicken, char grilled partridge and spiced pigeon cake we tried a selection of the pink fizzes ranging from Lanson’s NV Noble Cuvée to sparklers from Tasmania, Argentina, Spain, Italy and the Loire; two Pinot Noir dominant blends of Champagne from small producers in the grand cru village of Bouzy in the Montagne de Reims and Pol Roger NV Rich for good measure. Of the pink fizzes, the extra concentration of Lanson’s Noble Cuvée Rosé stood out as matching the intensity of spice in the first two dishes, although the lentils served with the chicken were hard for anything to cope with. Pinot Noir’s affinity with spice was also demonstrated by the 2000 vintage of Georges Vesselle’s Brut Zero while the other most successful match was Pol Roger Rich, which at least one panellist thought would have been the best option if you had drunk just one Champagne through the meal. In the spiced pigeon cake the higher chilli quotient was just too much for the dry styles of fizz and even the Pol Roger was a fairly poor foil. As we went on to an even more intensely flavoured main course of smoked rack of lamb – marinated in mace, cardamom, cream cheese and yoghurt and served with two sauces: mint, cashew nut and chilli plus onion and saffron – nothing worked until we turned to the sparkling reds, where the lack of harsh tannin, sweet fruit, a minty element and the inherent spiciness of the Shiraz grape coped manfully. Both the longer aged style of the Black Queen Sparkling Shiraz 1999, and the spicy Majella Sparkling Shiraz 2004 (Coonawarra) worked well, the only issue was the high alcohol level at lunchtime. With something lightly spicy and garlicky, especially if it involves fish or seafood, try an all Chardonnay style of fizz with a bit of zip. More intense flavours need a wine with more depth and concentration like an aged vintage Champagne or a more oxidative style that is perhaps encouraged by oak fermentation, styles like Bollinger, Gosset and the Georges Vesselle vintage we tried spring to mind. Off dry Champagnes, which may be classified as anything from ‘Extra Dry’ through ‘Sec’ to ‘Doux’, the sweetest, often work better with spicy food than they do with puddings. 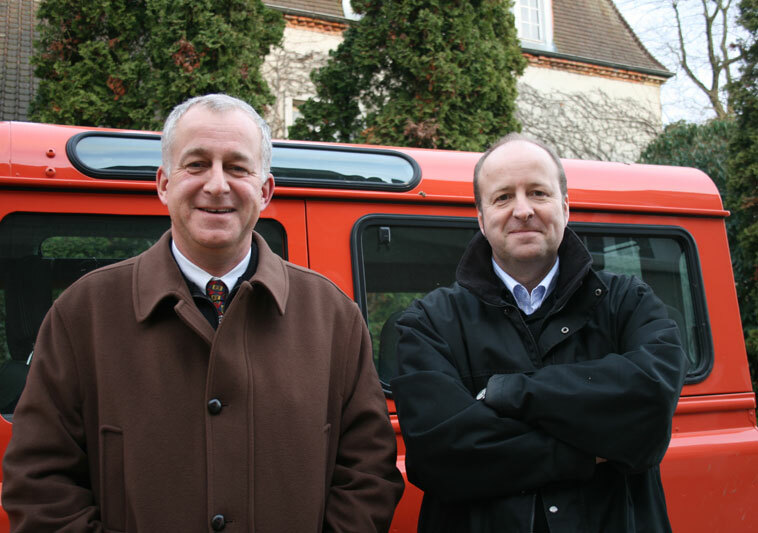 Jean-Hervé Chiquet and his brother Laurent have entirely changed how things are run at Champagne Jacquesson since they took over from their father over a decade ago. And with the release after nine years of ageing of three, single-vineyard, mono-cepage champagnes from the top-quality 2002 harvest, the quiet revolution at Jacquesson they set in train back then has neared completion. At last after years talking about vintage wines that they don’t make any more, the two brothers can discuss the four single-vineyard wines that have replaced all their vintage offering. “It has taken since 1998,” says Jean-Hervé, “or another ten years before that, if you count the time arguing about what we wanted to do with our father. The story won’t really be complete until we have re-released late disgorged versions of these three 2002 cuvées in another eight or nine years’ time,” he says, only half-jokingly. And while on the subject of late-disgorgement, he also announces new plans for a second release of their series 700 non-vintage wines. In late 2012 or early 2013 they will be re-releasing the non-vintage Cuvée 733 based on the 2005 harvest with four years extra ageing. “We plan to do this from now on [with the non-vintage Cuvée 700 series] and have held back 15,000 bottles plus 1,000 magnums for this purpose,” he says. The trio of white 2002 Lieux-dits champagnes: Avize, Champ Caïn, a 1.3 hectare plot planted with Chardonnay in 1962; Dizy Corne Bautray, 1 hectare of Chardonnay planted in 1960 and the smallest – Aÿ, Vauzelle Terme — just 0.3hectares of Pinot Noir planted in 1980, join the saignée rosé Dizy Terres Rouges (1.35ha of Pinot Noir planted in 1993), the 2002, 2003 and 2004 vintages of which are already sold out while the 2007 is yet to be released. The three 2002 single vineyard wines while certainly not fully mature – the fact that they are going to be re-released at the end of this decade gives you an idea of their potential longevity – have opened up considerably since I last tasted them at the winery in Dizy in January 2008 when they were still austere with piercing acidity. The Chardonnay from Dizy is now very expressive, showing ripe stone fruit with a terrific palate texture, weight and concentration plus considerable length. Avize Chardonnay is perhaps more classic, fine textured, great grip and mouth feel, long, pure and mineral with steely acidity still there in the background. The Aÿ Pinot Noir is rounder, more ample with generous fruit and a silky palate texture set against a marked chalky minerality. At the tasting in Jason Atherton’s Pollen Street Social, there was also the chance to assess side by side the last three Jacquesson non-vintage blends: Cuvée 733 based on the 2005 harvest, Cuvée 734 based on 2006 and Cuvée 735, which is made from the 2007 base and just released. This was given more relevance with the news from Jean-Hervé that significant stocks of each of these three wines have been put away for a second release after extra ageing. For anyone who has had the chance to taste these wines after additional time in bottle this clearly makes good sense, as Jean-Hervé says they are in many ways closer to vintage champagne in style than most non-vintage cuvées, partly because of the Jacquesson philosophy since the 2000 harvest of trying to make the best possible blend each year rather than look for conformity of style. Under the Chiquet brothers’ stewardship the entire Jacquesson range has evolved starting with the non-vintage wine, previously called Brut Perfection, which changed in one revolutionary step into Cuvée 728 from the 2000 harvest-based wine launched in early 2004. The single vineyard wines have evolved more slowly. They made a vintaged Blanc de Blancs from their three plots in Avize in 1990, 1993, 1996, 1997, while in 2000 they vinified all three plots separately, which was where the idea for the parcelaire approach came from. When they found Champ Caïn to be the best (the other two are La Fosse and Nemery ) they decided just to continue with that, using the remaining grand cru juice for the important 700 series non-vintage cuvée. 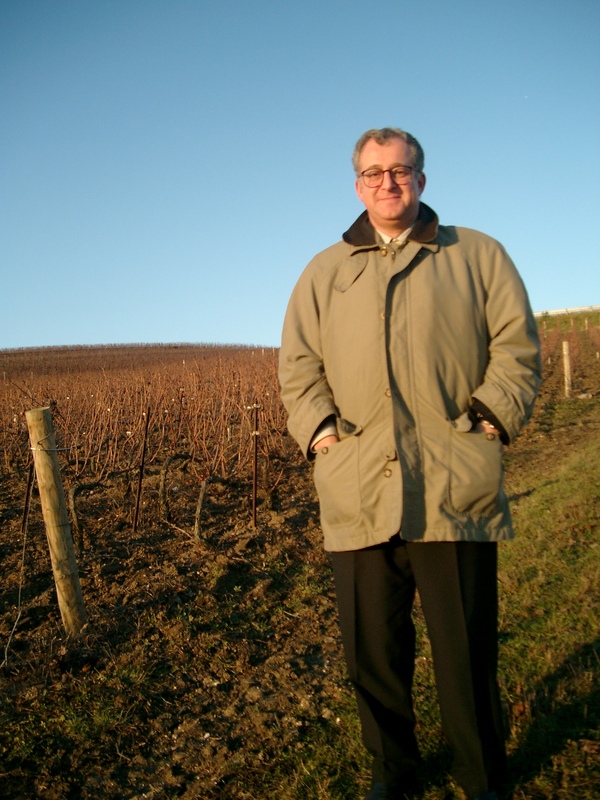 “Dizy all-Chardonnay was produced experimentally in 1995 – a great Chardonnay year,” says Jean-Hervé, “and next year (1996) which was good for Pinot Noir, we made a single bottling of Aÿ Pinot Noir.” Having been dissatisfied with the blended rosé they used to make, “we always liked the white wines better in our own tastings”, they decided to make a saignée only when they were happy with the quality and because they want to sell this while primary fruit is to the fore they release it earlier than the other three single vineyard wines. Slightly confusingly there are still some volumes of dégorgement tardif versions of previous vintages of Grand Vin Signature (including 1988, ‘89 and ’90) and Avize Grand Cru (1989, ’90 and 2000) plus straight vintages 2000 and 2002, the latter only released in early 2011 (link to Imbibe May/June 2011 pdf) in the market, but these wines are no longer made. There are now five wines in the entire Jacquesson range, the 700-series non-vintage cuvée, itself first released based on the 2000 harvest, and when the quality is high enough, the quartet of single vineyard cuvées. Jacquesson champagnes are available from UK agents Berry Brothers & Rudd and other specialist wine merchants.